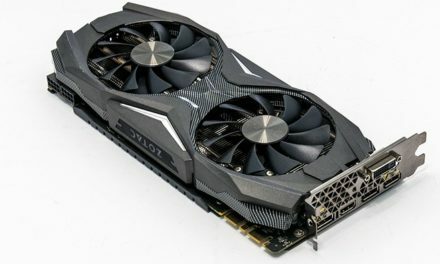 Introduction: I have been a big fan of action adventure RPG games as well as horror-based games for quite some time. One of my favorite series of games is Castlevania, of which has not had a good entry in the franchise for some time. After seeing a few previews and trailers, Bloodborne instantly caught my attention. Having never played a Dark Souls/Demon Souls game before I had no idea what kind of experience I was in for. 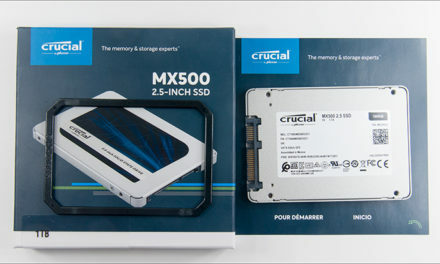 The only thing I have heard about the series is that it is very difficult and has a steep learning curve. This is true as the game is quite challenging but also a lot of fun at the same time. 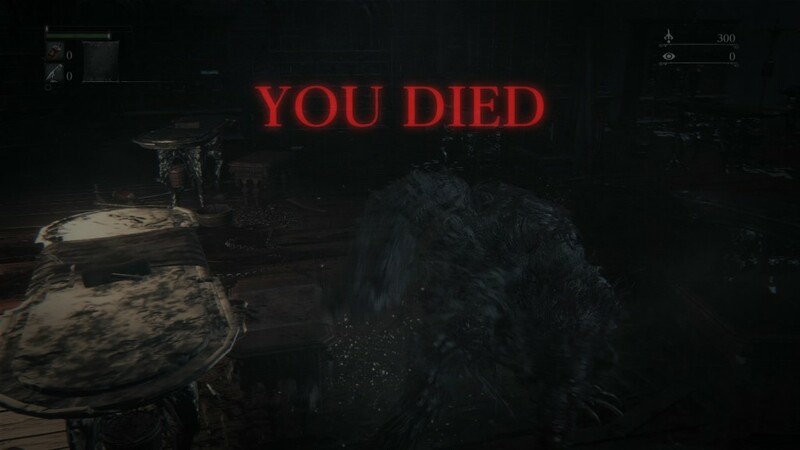 Story: Bloodborne starts with the players character strapped to a gurney and getting a blood infusion so that you can become a hunter in the town of Yarnam. In this town most of the inhabitants have become transformed into beasts or disfigured monsters that prowl and kill without prejudice. The cause of this is eluded to as the old blood as blood is the main cause of everything in Bloodborne and a recurring device in the main plot. As a hunter, you are tasked to slay the beasts around Yarnum and put an end to the current cycle. 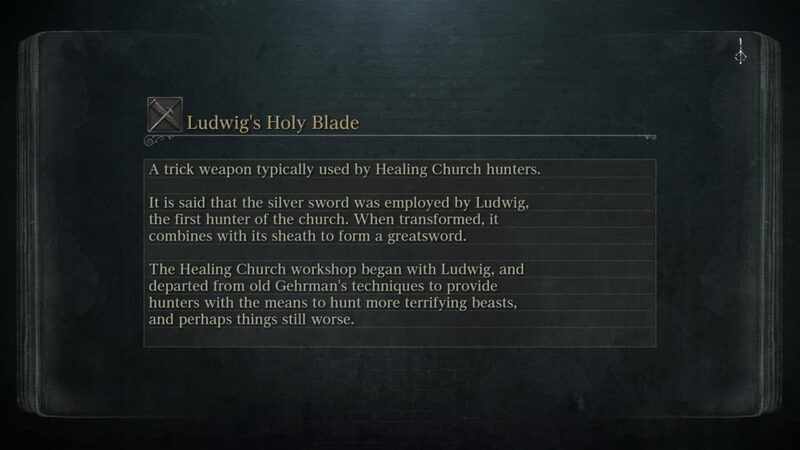 The story for Bloodborne is an interesting one, even though there are a few cut scenes to move along the story they do not explain much and a lot of the story is found in hidden documents and item descriptions throughout the game. This causes for very little in the way of storytelling and leaves much up to the player to discover on his or her own. I found this kind of storytelling ended up confusing me through a good portion of the game. This caused me to stop caring about the story entirely and attempting to understand it, in favor of just pushing ahead, and killing the various monsters and beasts. Bloodborne is one of the few games I have played that does not have a lot to offer in story, as most of it is hidden under the surface. 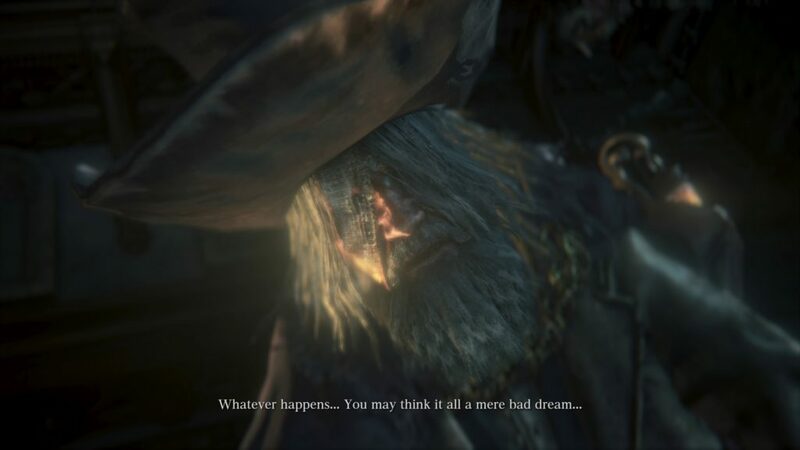 Although I am a firm believer that a story is not always the most important part of a game and Bloodborne is one of those games, which is great even without having much of a story at all. 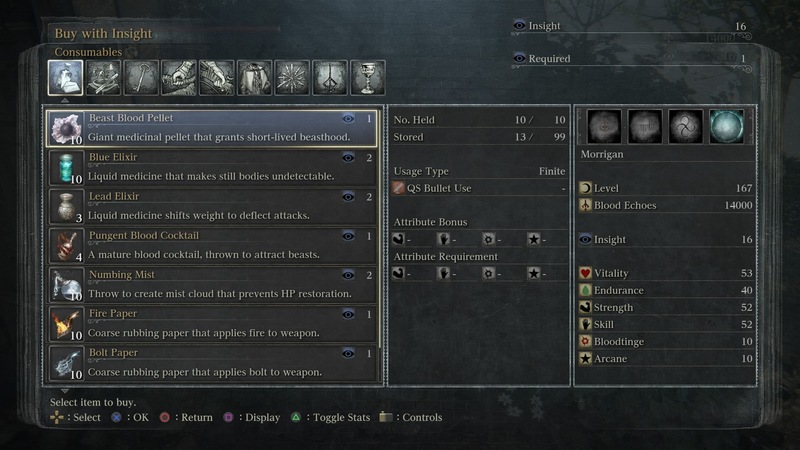 Controls: Controls for Bloodborne are pretty simple and straightforward. Triangle uses a blood vial to heal you, x is your action button, square uses a consumable item and circle is used to dodge attacks. The right stick controls the camera, while the left stick controls the player character. As for the d-pad buttons; up is used to gain bullets at the cost of HP, down cycles through consumable items equipped, right switches your right hand weapon and left switches your left hand weapon. L1 button transforms your right hand weapon into a longer version or back to the shorter form, when the weapon is in long/transformed form your left hand weapon is unable to be used. L2 is used to attack with your left hand weapon (gun or torch) or special attack with a transformed right hand weapon. R1 is your standard attack with your right hand weapon and R2 is your strong/charge attack with your right hand weapon. 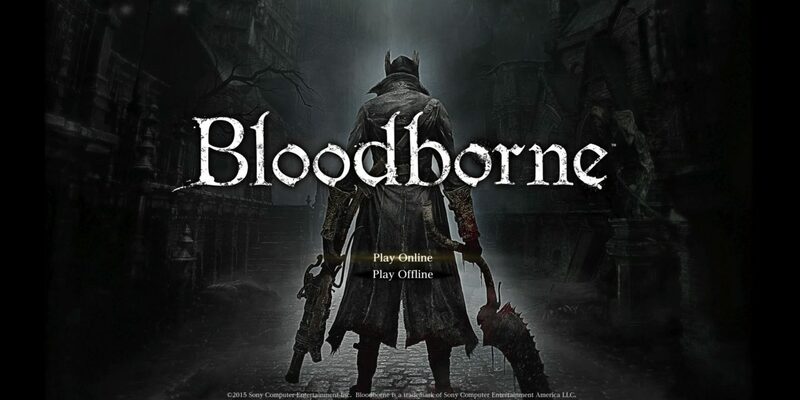 Game Play: Bloodborne plays similar to one would expect out of the action RPG genre, as characters can find weapons and armor, level themselves up and upgrade their gear as they progress. 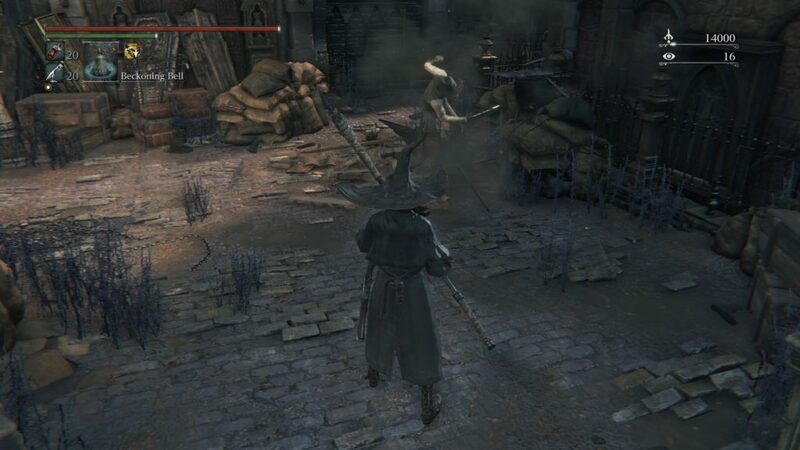 One of the key things to Bloodborne is all character actions other than regular movement uses stamina. Therefore, whether or not you are dodging an attack, sprinting or using an attack yourself you have to watch that you do not expend all your stamina and find yourself in a tough spot. Having no stamina to dodge an enemy’s attack can almost certainly incorporate death. Depending on the weapon and the attack being used different amounts of stamina are required, stronger attacks use more stamina and often melee weapons use much more stamina than guns. As you traverse Yarnum and defeat enemies you will obtain blood echoes, this is your currency for most shops as well as experience used for leveling up your character. In order to level up though you need at least 1 point of insight which is obtained from certain items or from encountering a boss and defeating boss fights in your own game world. If you die at any time all blood echoes on your character is lost, but can be regained by returning to the point you died and either picking them up from the ground or killing an enemy that has taken your blood echoes nearby. 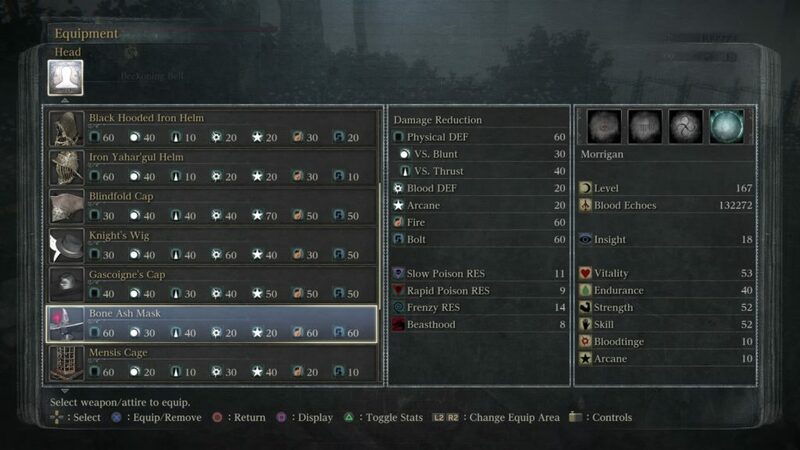 Enemies that have a players blood echoes will have glowing eyes making it easy to tell which enemy needs to be defeated in order to regain lost blood echoes. Although if you die again before regaining blood echoes, those blood echoes are lost forever. When you get your first point of insight, you will be able to obtain a beckoning bell and resonant bell. The beckoning bell allows you to summon the help of players from other worlds at the cost of one insight in the same area, as you are to help you with traversing the area and defeat that areas boss. 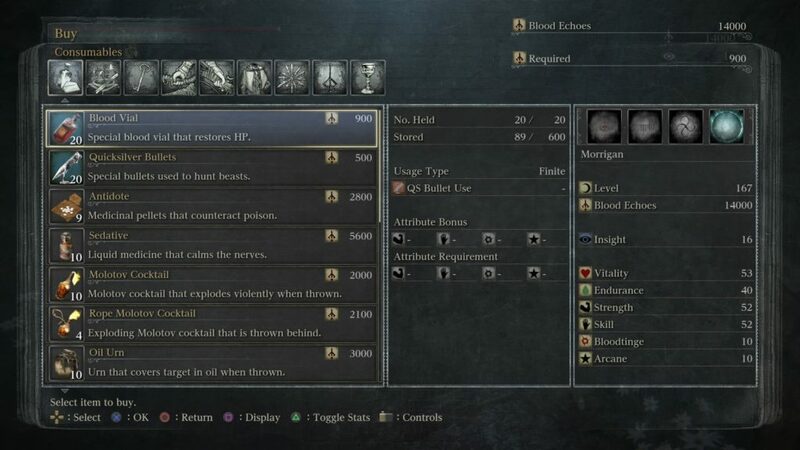 In order for another player to join you they need to be ringing their resonant bell, you can also use your resonant bell in order to join people in other worlds to gain blood echoes as well as learn boss mechanics at no loss of blood echoes upon death. This is a very useful way of gaining insight at low levels, if you defeat a boss in another players world you will gain one point of insight and it does not cost any insight to ring a resonant bell. Insight can also be spent as currency at a special shop in the hunters dream. Although to access this shop, you need a minimum of 10 insight or the shop will not be open. Insight has many different effects on the game world as you obtain more and more, as it can cause stronger enemies to spawn in various areas, as well as the player to see things that are not visible to the player otherwise. Insight also lowers a characters beasthood stat and frenzy resistance. When you obtain your first point of insight and return to the hunters dream there will be a doll that you can speak to that will trade blood echoes for increases to your main attributes, which level your character up. Vitality increases your characters HP (hit points); Endurance increases stamina as well as poison resistances. Strength increases damage with most physical melee weapons for instance axes, hammers and swords. Skill increases damage with skill-based weapons such as the hunters cane, burial blade etc. Bloodtinge increases damage with all gun based weapons and hunter skills. Lastly, the arcane stat increases arcane damage such as Molotov’s, elemental weapons and some other weapons when imbued with an elemental bloodstone to change all damage from strength based to arcane. As you explore Yarnum you will obtain varies weapons and armor of which all have similar stats but will vary in use. With weapons, damage typically starts higher with melee and ranged weapons that have shorter range. Although the difference is mostly based on how you build your characters stats, if you make a skill build a lot of skill weapons which when transformed have more range will start having higher damage then strength weapons and vice versa. Although strength based weapons do typically start with higher damage output, they do not have long range and require being relatively close to an enemy for most attacks. A good example of strength vs skill weapons would be the kirkhammer vs the hunters cane, the kirkhammer has very high starting damage and starts in regular mode as a sword, when transformed it becomes a giant hammer that is slow and requires being extremely close to an enemy to pull off attacks. On the other hand, the hunters cane starts out with similar range as the sword in its regular form but transforms into a chain whip with exceptional range but low damage. Depending on one’s playstyle and skill level both have their own use in combat. 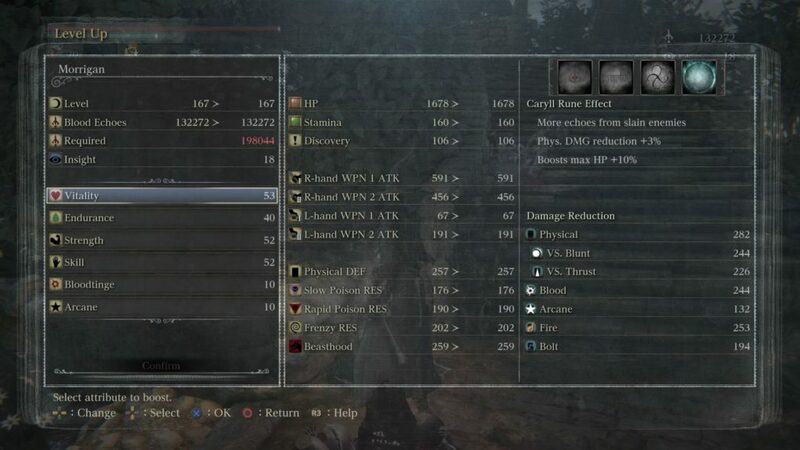 All weapons require a players attributes to be at a certain value to equip, although the stats required for right hand weapons will always be stats that effect the damage output of the weapon. Left hand weapons are slightly different then right hand weapons, as they are either torches or firearms. Firearms use ammo, which a player can have up to 20 bullets at a time, and some firearms use multiple bullets per shot. For example, the hunters pistol uses one bullet per shot, the repeating pistol uses 2 and the cannon uses 10. All left hand weapons are effected by either the players bloodtinge or arcane stat for damage multipliers. Although some weapons require skill or strength at a certain value to be equipped even though those stats do not affect the amount of damage they do. For upgrading the various weapons you get through the game you will come across blood stone shards, blood stone chunks etc. These are used to upgrade any weapon to its next level up to a maximum of 10, with various amount of stones and higher-level ones needed. Example at level 1 you need 3 blood stone shards, at level 3 you need 8, at level 4 you need 3 twin blood stone shards. 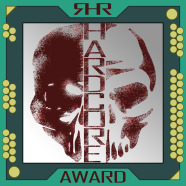 You obtain these from killing various enemies and finding them on the ground in areas some even hidden as you explore the game. 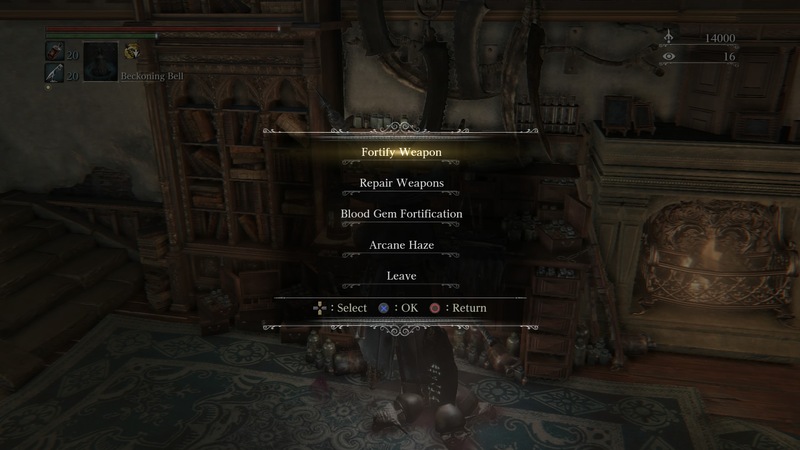 If you defeat a certain optional boss, you can also imbue weapons with blood gems, which increase the weapons damage, add elemental damage etc. 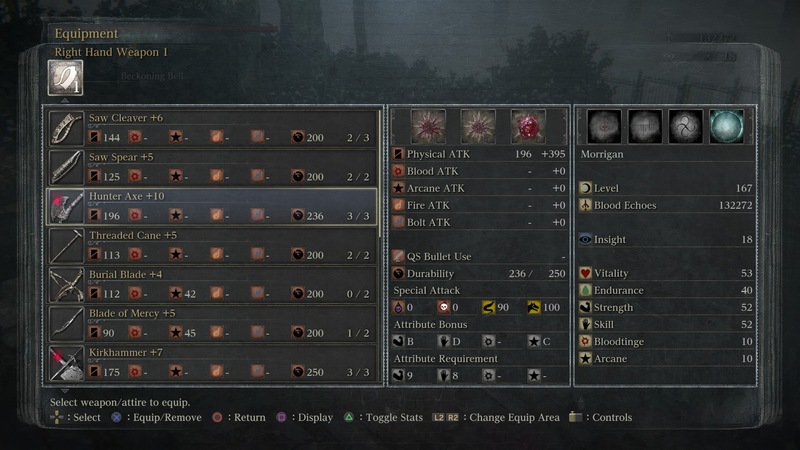 Blood gems are found in the same way as shards as you will find/obtain them as you progress through the game. As for armor the differences in stats is definitely one to take in consideration for what types of enemies you are facing at that time. As overall most armor has very similar defense with points moved around between various damage resistances, example one might have 20 more fire resist but also has 10 less physical defense on it, making that armor superior in fighting enemies that use fire based attacks. As for defensive stats themselves, the player character has physical defense, slow poison resist, rapid poison resist, frenzy resist. As main defensive attributes, as a character gains level the physical defense will always slowly increase, while poison resist is based on gear and ones endurance stat. frenzy resist is based solely on gear and ones insight value and very important as when inflicted with frenzy a player loses 80% of their current HP. 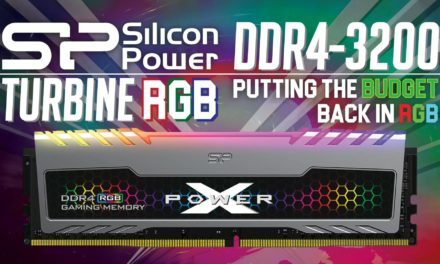 For secondary damage resist stats, which are only effected by gear or equipped runes include blunt, thrust, blood, arcane, fire and bolt resistance. Blood damage is considered any damage from firearms and arcane is considered anything magical or elemental based. When exploring Yarnum and defeating the various monsters you will come across quick items and hunter skills, which you can equip, to your quick slots to use at any time and be cycled through. These items can be healing items, antidotes or even weapons such as throwing knives, pebbles or weapon/player buffs. Such as elemental paper for various weapons, bone marrow ash which increases firearm damage etc. As for hunter skills, these are unique and use your bullet ammunition to use; these include Beast Roar, which causes the character to knock back all enemies around them. A Call Beyond, which creates a star explosion that is a homing attack on enemies. All hunter skills either drop from bosses or are found in hidden areas throughout the game. Caryll ruins can also be found throughout the game, you can equip up to 3 of them via the workshop in the hunters dream which can help boost HP, damage resistance and even item drop rates from enemies. As for the enemies, many start out as beasts, werewolves, humans and various undead. 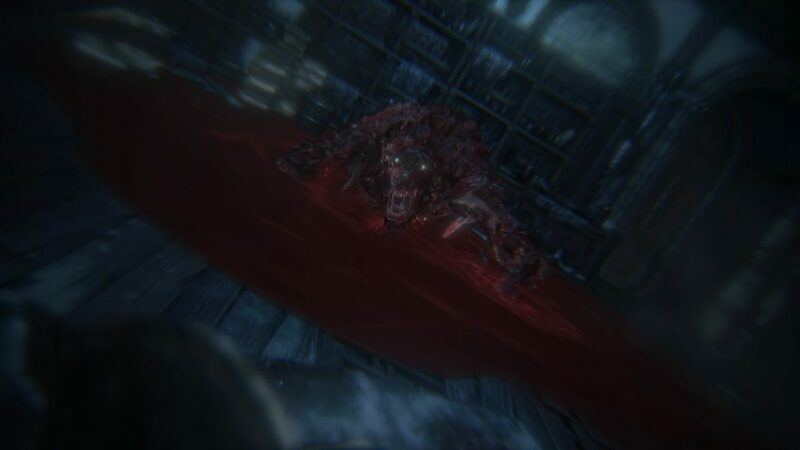 As you traverse through the game enemies become more interesting and grotesque, with a large variety of enemy types and strategy to overcome them. Some enemies are relatively slow and big and do large amounts of damage and others small and fast but that is not always the case as some larger enemies can be extremely fast and deadly. This carries over into the various boss battles as all bosses are unique and require thought and strategy to overcome. 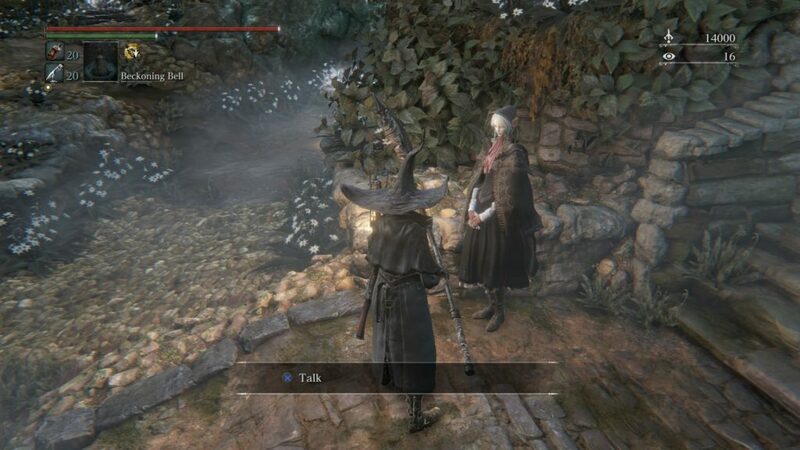 Overall, I found Bloodborne quite hard at first, the first few hours of the game were some of the hardest moments I have had in an action RPG game, but as the world opened up more and I learned how to effectively deal with enemies, the game became much more enjoyable. This requires a lot of patience and the ability to adapt and learn enemy patterns consistently as one new enemy can be any players downfall. As you progress through the game, you will come across optional bosses, which you probably do not even realize are optional and will unlock hunter skills, like weapon modification via blood stones or chalices. The chalices are used to create chalice dungeons to explore and offer some of the hardest optional fights in the game. They also reward the player with versions of weapons that are not found in the regular game that are unique and slightly differ from the versions you acquire from the main game. All chalice dungeon materials can be found in the dungeons themselves except for the first one, which you can find the materials as you explore the main game itself. All chalice dungeons have unique codes when created and only players with the same code can enter those dungeons making it so you share your code with friends or after making a dungeon entering a dungeon code for that same dungeon on one of the other chalice headstones. Once you have created a chalice dungeon you no longer need the materials to make various versions of it so you can always go to another headstone and enter a new code of the same dungeon. As you progress to the lower depths and into the stronger dungeons some will have unique properties, like PVP bell ringing enemies that summon other players to fight you in your dungeon, or for the defiled chalice your HP is halved while inside the dungeon. All chalice dungeons have 3-5 floors on them with a boss on each floor and occasionally regular bell ringing women that summon red enemies to attack you. 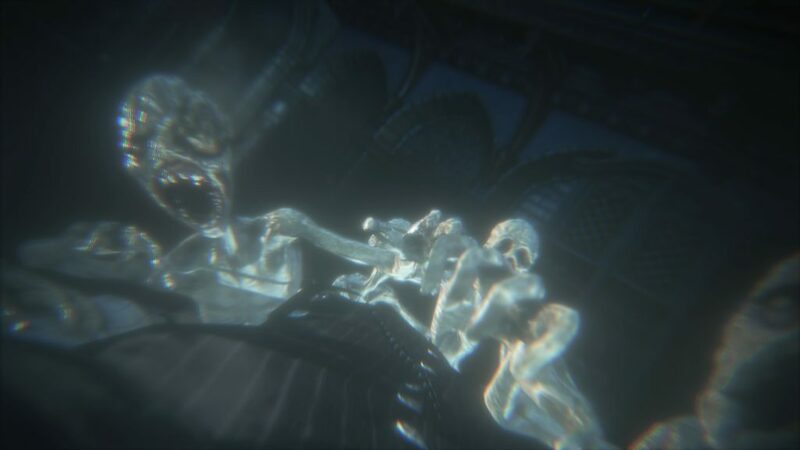 These enemies will spawn endlessly in growing numbers until the bell ringing maiden are defeated. 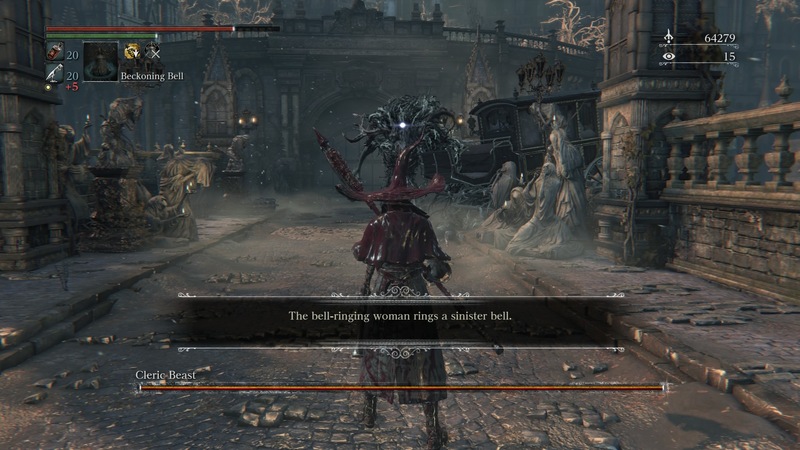 It is always a good thing whether in the main game or in a chalice dungeon to seek out the bell ringing maidens first and defeat them so that enemies stop spawning or so that other players do not join your world as an enemy. 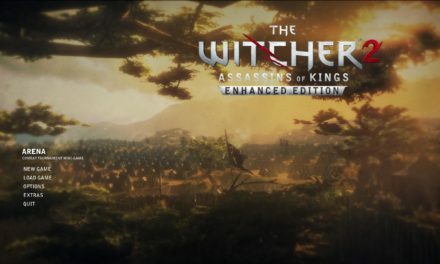 Graphics/Music: The graphics are solid and well done for the PS4; this is one of the best-looking games I have seen yet. The detail in the environments and enemies is great with very little clipping in the environments themselves. I did have a few incidents of clipping the background with the swing of the camera but this was extremely rare. The music was also amazing. This game is an action RPG with a horror setting. Often at times I found myself more tense or even scared at times of enemies jumping out and instantly killing me, much like that of a survival horror game. This game surprisingly has more of a horror element to it, than most survival horror games I have played. The tension of the atmosphere and music really drove this and carved a wonderful experience. Recommendation: Bloodborne is a game I can recommend to any die hard action RPG fan that would like a challenge, the game is quite enjoyable and challenging and you will spend many hours exploring the world and defeating and being defeated by the various monsters throughout. To those who do not enjoy a challenging experience it may be better to pass on this game. 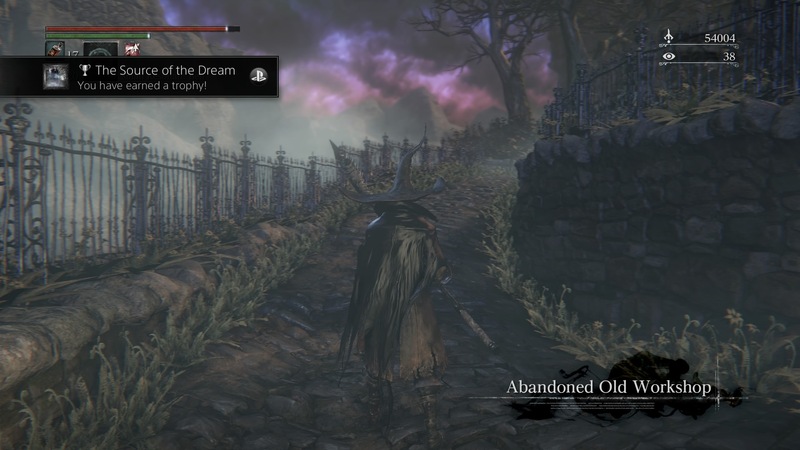 Conclusion: Bloodborne is every bit as challenging as the reputation of its predecessors, at the same time it is also one of the best action-adventure horror games to come out in recent years. With more tension and atmosphere then most survival horror games and refreshing on its own, as not many games cater to this genre of games. Even with a weak story, Bloodborne holds its own as one of the best action adventure games of this year.